Panchayat Union Middle school, kattumalaiyanur is a government middle school that accommodates classes I to VIII. 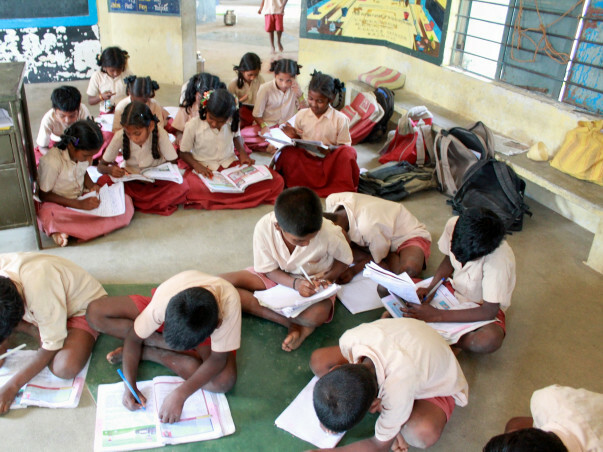 This school is located about 16km from Tiruvannamalai, TamilNadu, India. the village is still poorly developed and people are still unaware of many things that a normal villager will know. Education ratio is very poor.Children opting for higher studies are very minimal. We, the stafs working in the school are slowly trying to change the scenario in the village. About 180 students are studying in our school. All our staffs have a strong will to provide our students with all the basic infrastructure needed to study well. We are continuously providing students with wide variety of chances and programs to develop themselves.We have conducted so many programs throughout the year to develop our students in all the possible skills. At present the primary building which accommodates classes I to V needs renovation immediately. Inspite o many petitions to the government we are unable to renovate the building and hence decided to raise fund to renovate the building. These kids in our school need a proper building to learn. 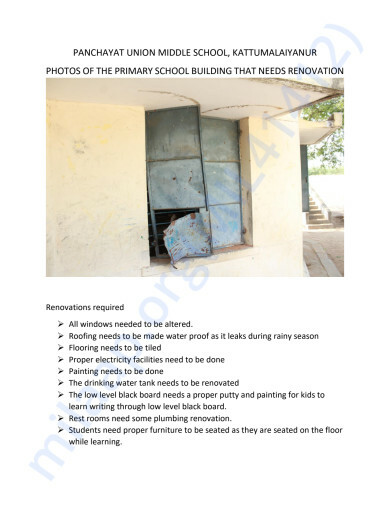 Photos of the Primary Building that needs renovation. Work is in progress at a fast pace. Thanks all for the support. The windows have been fixed. A new name board has been fixed for our school. The name is yet to be painted. Painting work has begun. The classes are already looking so amazing! Thanks to all donors who have donated towards our cause. We have received the required amount through milapp and through some direct donors and the renovation work is in progress at a very fast rate. Will keep posting the updates soon. Thanks again to all supporters of the campaign and donors. We have started laying tiles. About 14 fans have been installed in all. The leaky ceiling has been fixed. Low level black boards have been fixed. As of now laying of tiles is going on. We have ordered the windows that needs to fixed. We have also ordered a new name board for our school. Once the tiles work is completed we will be going ahead with paintings.